B.Z. 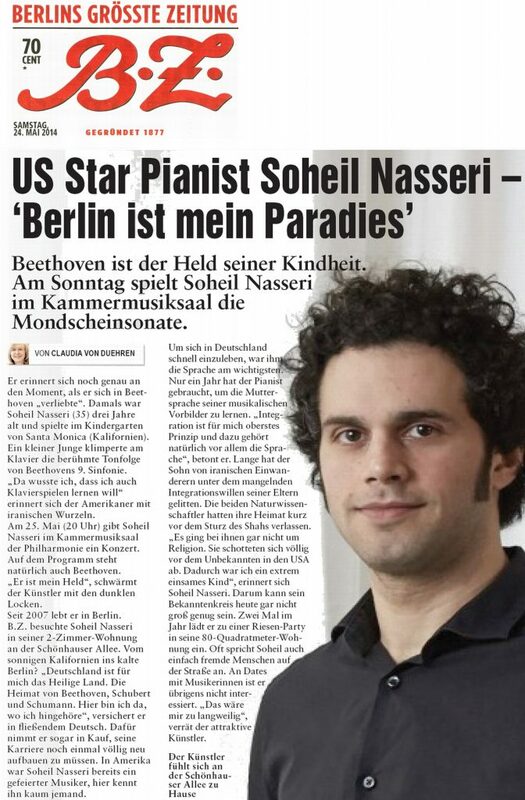 Berlin: American Piano Star Soheil Nasseri: "Berlin is my paradise"
Beethoven is his childhood hero. On Sunday Soheil Nasseri is playing the Moonlight Sonata in the Philharmonie. He still remembers the exact moment that he fell in love with Beethoven. Back then Soheil Nasseri (35) was three-years-old and was playing in his day-care center in Santa Monica, California. A little boy played the famous melody from Beethoven’s Ninth Symphony. “That’s when I knew that I also wanted to learn the piano” said the American with Iranian roots. On May 25 (at 8 pm) Soheil Nasseri is giving a concert at the Kammermusiksaal in the Philharmonie. The program includes Beethoven, of course. “He is my hero,” gushed the artist with the dark curls. Since 2006 he has lived in Berlin. B.Z. visited him in his 1-bedroom apartment in Schönhauser Allee. From sunny California to cold Berlin? “Germany is the Holy Land to me. The home of Beethoven, Schubert and Schumann. Here I am where I belong,” he asserted in fluent German. And he accepts that one needs to build a career here from scratch. In America Soheil Nasseri is a celebrated musician, here hardly anyone knows him. In order to feel at home in Germany, at first the language was most important. In a year the pianist had learned the mother tongue of his musical role models. “Integration is my most important principle and to succeed at it of course the language is most important,” he emphasized. For many years, the son of Iranian emigrants suffered due to a lack of desire to integrate on the part of his parents. The two scientists had left their homeland shortly before the fall of the Shah. “For them it was not at all about religion. They sealed themselves off completely from the unfamiliar in the USA: As a result I was an extremely lonely child,” remembered Soheil Nasseri. Thus today his circle of acquaintances could not be larger. Twice a year he throws a huge party in his 900-square-foot apartment. Often Soheil speaks to strangers on the street. And he is not interested in dating other musicians. “I find that boring,” confided the attractive artist.